Before I went vegan I loved cheese sticks. These vegan cheese sticks are the perfect alternative! Crispy on the outside, ooey gooey on the inside! Before I went vegan, I loved cheese sticks – a little bit too much probably. Good thing for my body, vegan store-bought cheese sticks aren’t a thing (yet) and we don’t have them in restaurants, so making them at home is the only way I can still indulge in some ooey gooey cheesy goodness. For the cheese, I used Wilmersburger, which is a german vegan cheese brand. It’s one of the few brands that offers vegan cheese blocks and I really like the taste, so that’s why I used them. But if you have Daiya or any other vegan cheese available, you can totally use those instead. Like so often, we need a batter and we need a breadcrumb mixture. For the batter, I used a simple all-purpose flour, water and kala namak (black salt with an awesome eggy taste) mixture. As for the breadcrumbs, I used panko flakes which make them suuuuper crispy, and added salt, herbs and spices. 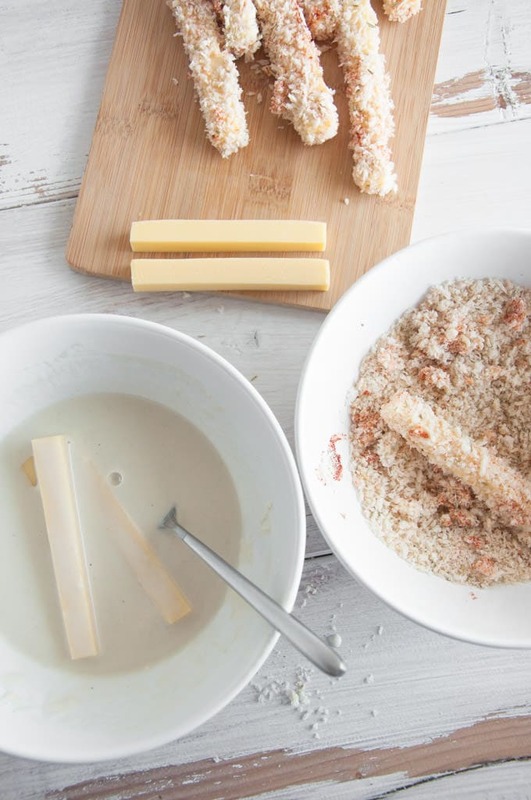 Once we’ve cut the cheese into sticks, we dip them first in the batter, than coat them in the breadcrumbs. I usually avoid frying at home, but for these cheese sticks, which I eat maybe 1-2 times a year, I can totally make an exception. 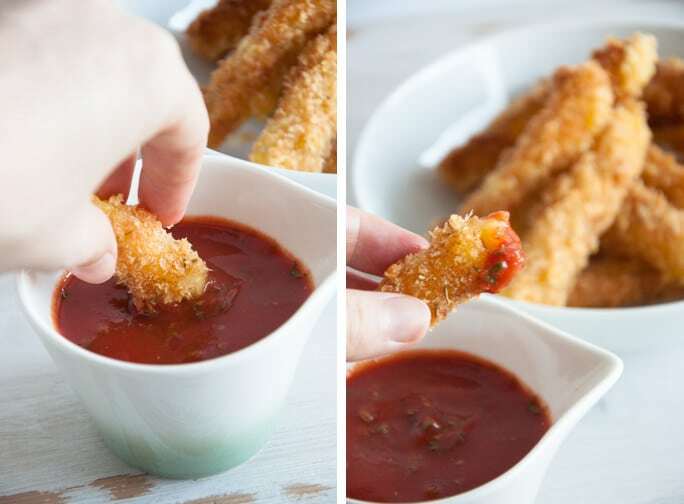 Vegans can indulge in cheese sticks too: With homemade vegan Cheese Sticks! These are perfectly crispy on the outside and ooey gooey on the inside. Time to bring that comfort food back to our plates! Cut the cheese in sticks. Mix the ingredients for the breading in a bowl. Mix the ingredients for the batter in a separate bowl. 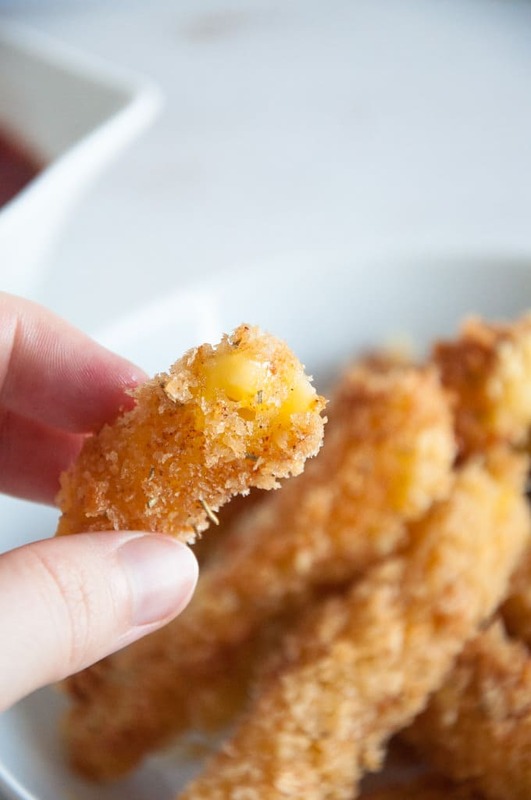 Dip the cheese sticks first in the batter, then in the breading. Make sure they are as fully coated as possible. 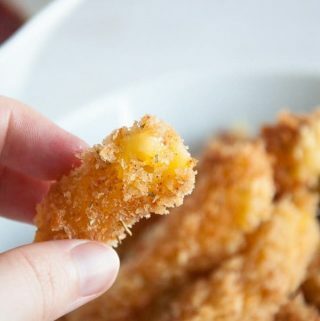 Once all the cheese sticks are coated with breadcrumbs, heat the frying oil in a small pot and fry the cheese sticks for a few minutes until golden brown and crispy. Place the cheese sticks on a kitchen paper to remove excess oil. Serve and enjoy! I've served them with a simple tomato dip (tomato puree, salt, dried herbs). Ah! I made vegan mozzarella sticks this summer!!! So fun!! But I didn’t use any actual “cheese” ;) I’ll have to post soon! Oh my cheesy indulgent goodness! 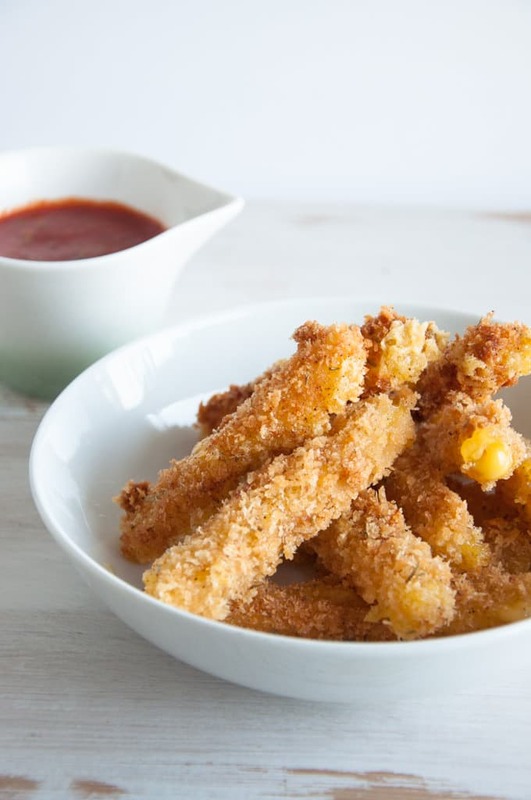 These look better than any cheese stick I ever had before my vegan days, you got the breading just right? 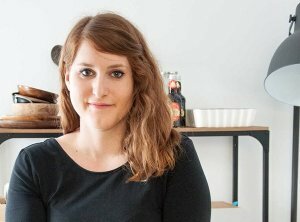 It’s actually a little surprising none of the vegan grocery store brands have done this yet, you beat them to it! Aww thank you Natalie! The breading has to be right, after years of breading schnitzel, then vegan schnitzel :D It’s one of the perks of being Austrian, hahhaa. Yeah.. I hope it’s only a matter of time before vegan cheese brands start selling cheese sticks. I love that stuff.. These came out perfect! I am so excited Ithat I learned how to make vegan cheese sticks. This is just so creative! Yeay! Glad you liked them, Thomas!